Opinion: Who are the Knicks? NEW YORK CITY (WABC) -- We are just three games into the NBA season and the grumblings are already started concerning the Knicks. But who are these Knicks? Trying to answer that question is where the problem really begins. This team has no identity. There is one superstar player in Kristaps Porzingis and then 11 other individuals, but there is no identity of a team here. Yes, Enes Kanter can be a force on the offensive end, and seems like a good guy, but he can't play defense. Kanter's play has cut down on the time for Willy Hernangomez, who made the all-rookie team a season ago and now has trouble getting on the court. Courtney Lee continues to do nothing outstanding, as does high priced free agent Tim Hardaway Jr. The biggest problem with this roster is there remains no point guard who can make a difference. The NBA is now a guard dominated league and the Knicks come up short. Ramon Sessions and Ron Baker are nothing more than backups. Top draft pick Frank Ntilikina cannot stay healthy enough to see the court. Ntilikina was expected to be a project, but this team needs him to produce. 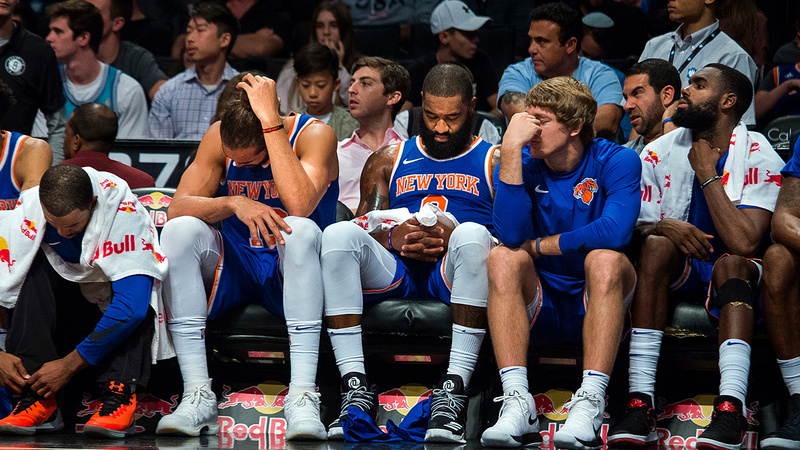 Jeff Hornacek may soon feel the pressure of the Knicks new management group, the team has already complained that not everyone understands the offense. That cannot go over with the Knicks brass. But worse, this team has already blown a 21 point lead at home against Detroit, and did not appear competitive at Boston. Granted this season is still young, but the Knicks need to find an identity and become a team instead of 12 individuals.